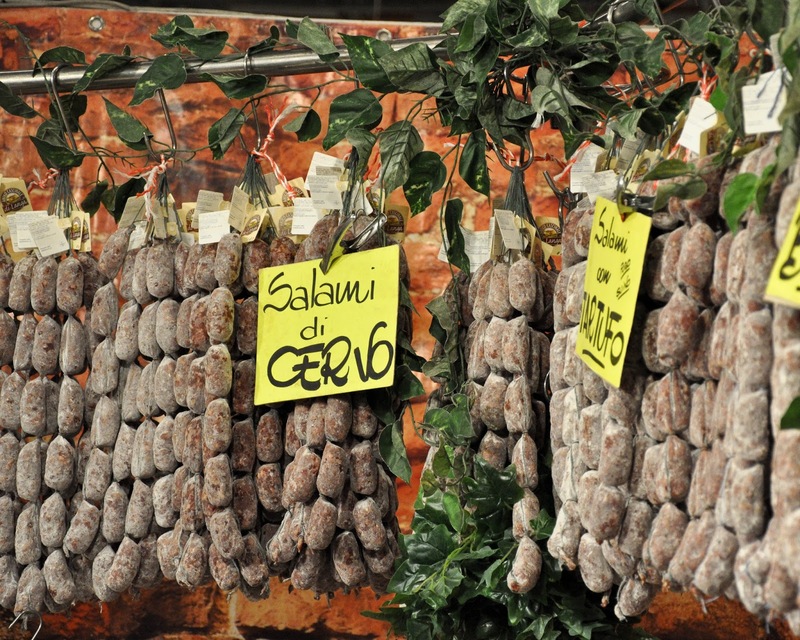 Have you ever wondered how come Italian food has become so popular all over the world? Anywhere you go, there is bound to be an Italian eaterie in close proximity, not to mention the fact that the menus of most restaurants feature at least one Italian-inspired dish (risotto, anyone?!). People often cook Italian meals at home and are only too happy to adapt them to their own taste, sometimes creating in the process a brand new dish, which no-one in Italy has heard of, but which, nevertheless, enjoys a huge popularity abroad with its Italian name and ingredients. The infamous spag-bol, so beloved of the English, springs to mind. adaptability – to people’s differing skills and tastes. Everyone can learn to cook pasta and dress it with pesto for a quick yet tasty supper. As for ordering pizza just as you like it, there are whole companies set up for this purpose, not to mention every country’s contribution to the list of weird and wonderful, but pleasing to the local tastes, toppings (cajun flavoured pizza?! what about pizzas garnished with green peas, barbeque sauce and pickled ginger?! although and, thankfully, not at the same time). relative inexpensiveness – yes, students the world over have a lot to thank pasta for. I have had my fair share of localised pasta and pizza plus many authentic Italian meals through the years, more so since we moved to the Northern Italian city of Vicenza last year. 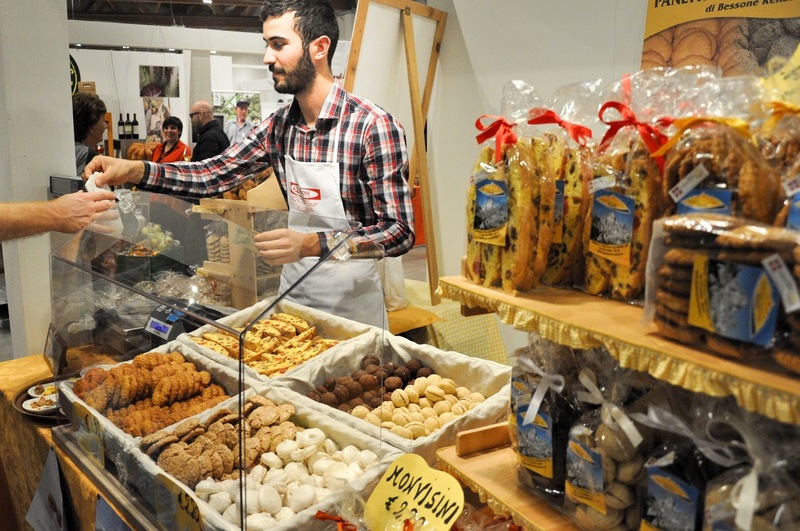 Since then, as a family we have taken every opportunity to learn more about Italy and its culinary traditions, so when I found out that a huge food fair was taking place here, it was a prospect I couldn’t resist. 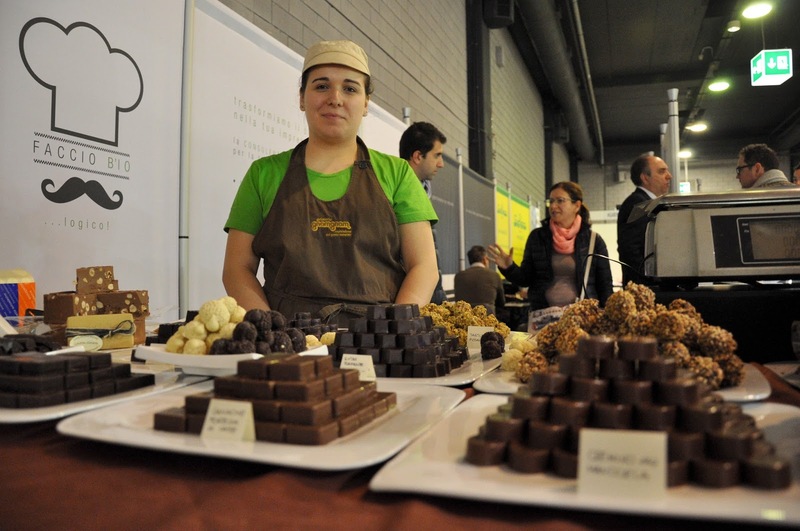 CosmoFood Fair is held once a year in a gigantic building just outside of the city, where major fairs and exhibitions are organised every month. 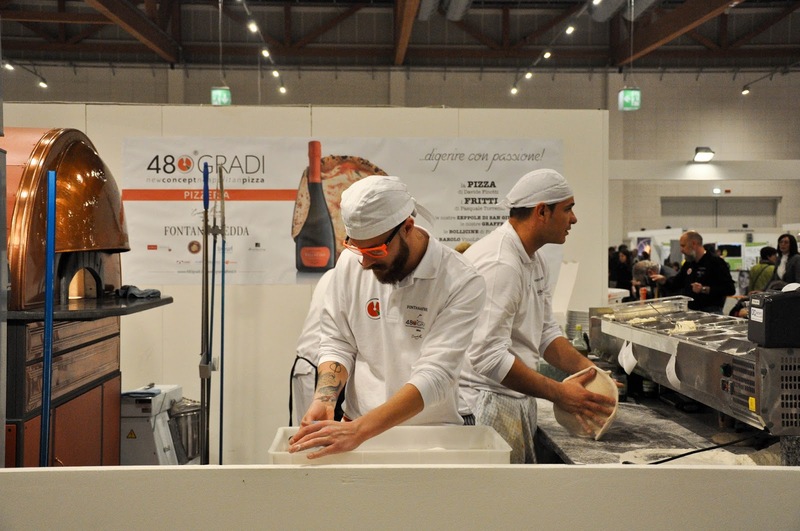 It showcases the best of Italian food, drink and food technology producers with over 3000 products on show and over 100 workshops, tastings and courses spread over four days. So, we piled in our little red car and headed there. 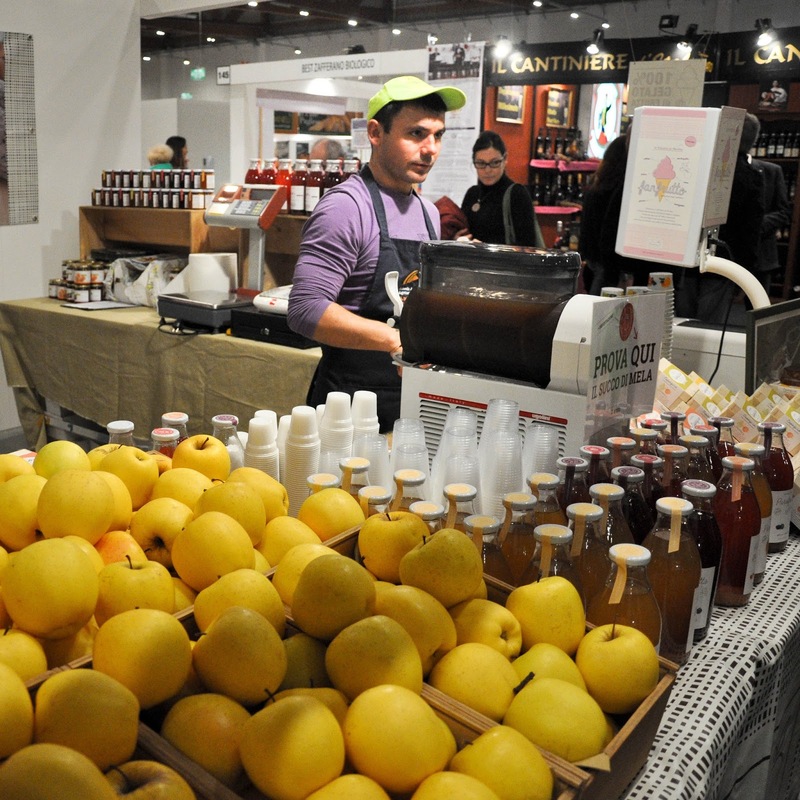 The exhibition was open to both industry insiders, like owners of restaurants, pizzerias and bars, and the public – eager to sample its way through the stalls of the hundreds of exhibitors. When we arrived early on Sunday morning, the flock of visitors was already thick and fast and the spirits were high, which always seems to be the case in Italy when food is involved. We bought a ticket for my husband and I collected my press pass (thank you, CosmoFood Fair for accrediting me!). 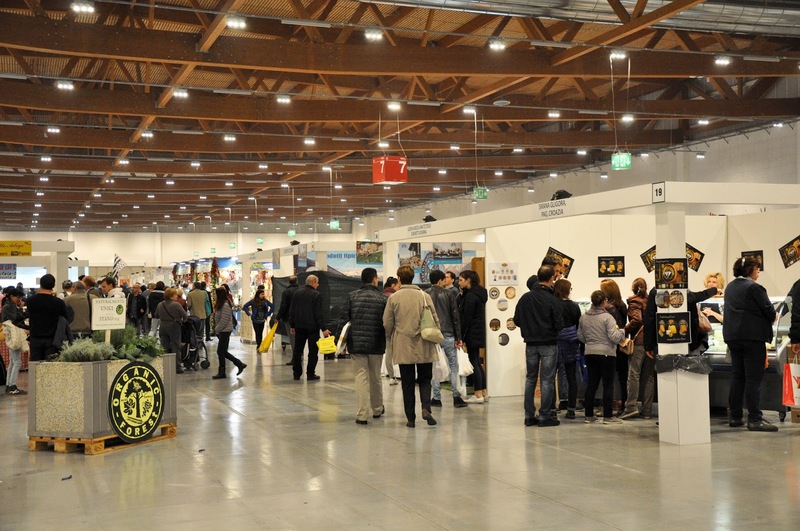 Two huge halls were spilling over with the exhibitors’ stalls, so we walked straight into the action. 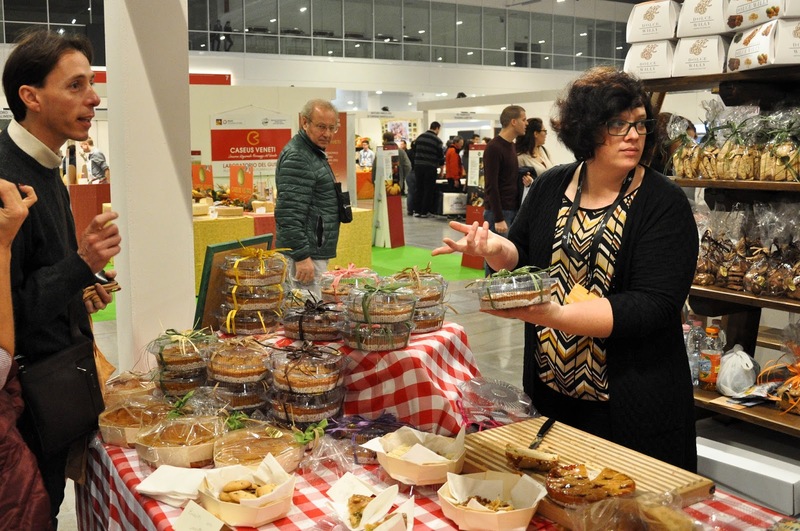 There were handmade chocolates, vegan biscuits, whole legs of prosciutto, long strings of sausages, apple and bergamot juice, honey galore, organic marmalade, pizza, a mind-boggling variety of cheese and more. Much, much more. 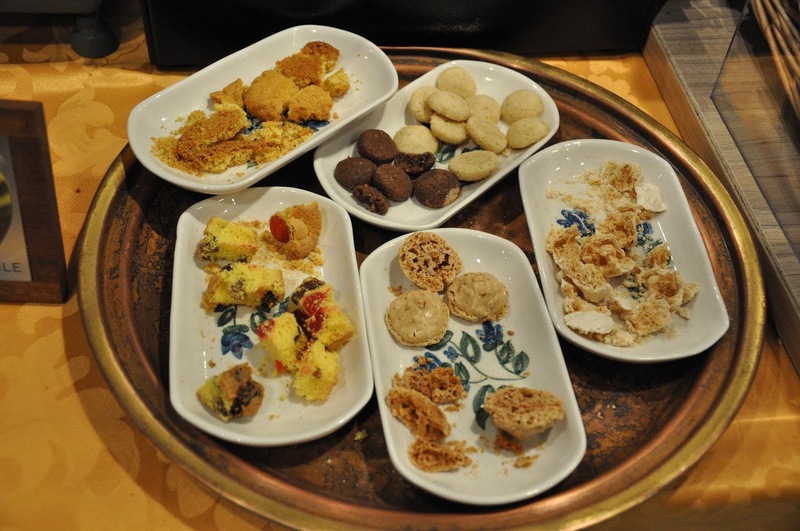 The full culinary spectrum of Italy was presented – from Sicily and Reggio Calabria all the way up to Veneto and Piedmont. 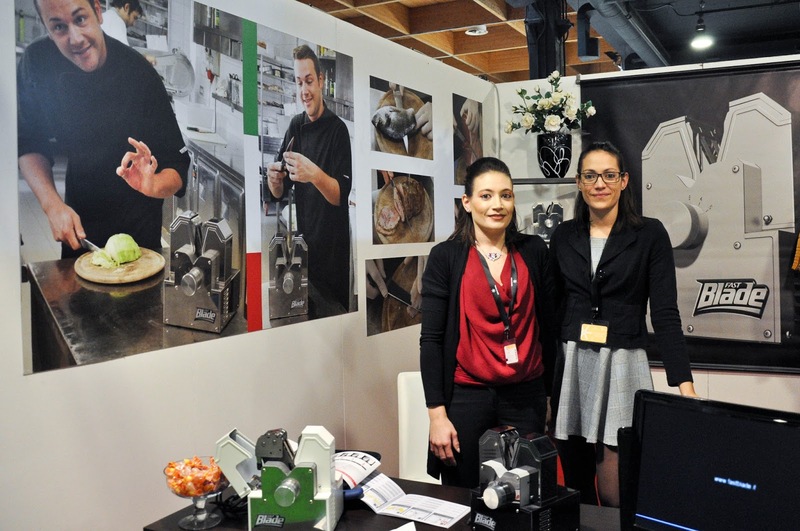 As luck would have it, the first hall we walked in, was the one where the food technology and food business exhibitors had taken residence, so we spent a bit of time marveling at the machines and gadgets which make the food industry tick. I was particularly taken with this clever machine used to sharpen knives in professional food environments. It is the one thing which always gets to me when I am cooking at home – having knives which I have to hold really tight and press hard against the meat or bread in order to make a cut, rather than slicing through it all with ease. So, this machine seemed like a godsend, that’s it, if I had a restaurant. At least, I had a good chat with the two ladies at the company’s stall, which is always great. I was also really impressed by a company providing marquees for events held in such amazing places like the rooftop of Milan’s Duomo. Honestly, if I am ever in a position to have a party up there, consider yourself invited. After that we made our way to the second hall where CosmoFood Fair was held. And then the really fun part began. We found ourselves at the start of a huge maze of stalls. 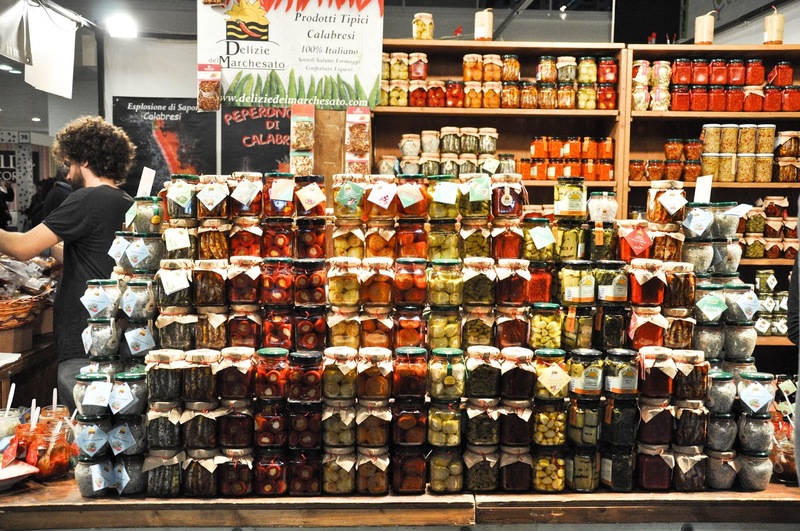 Everywhere we looked a stall with piles of gorgeous Italian food was beckoning at you. 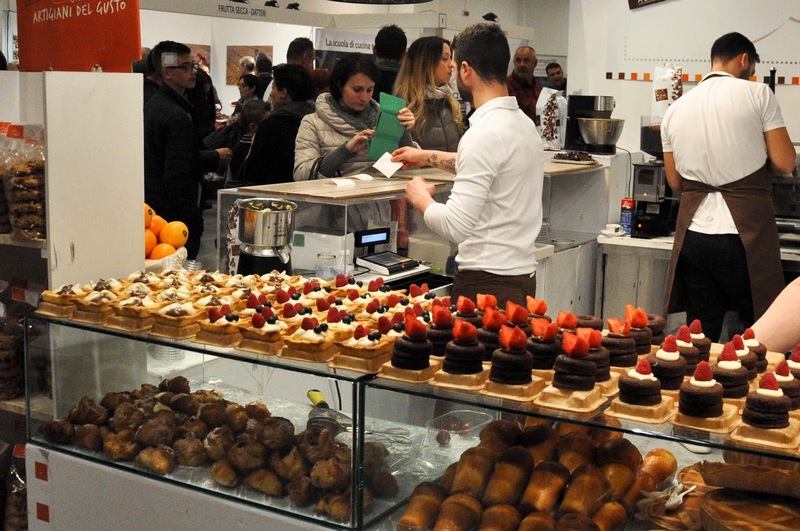 People were scurrying back and forth between them all, clutching cones overstuffed with gelato (yes, eating ice-cream during the cold months is perfectly acceptable in Italy), hot slices of freshly baked pizza, cups of juice and handmade cookies. For a moment, it was so difficult to decide which way to head to, so, eventually, we simply dived in, zigzagging through it all, stopping here and there, chatting to the sellers and producers and sampling their amazing wares. 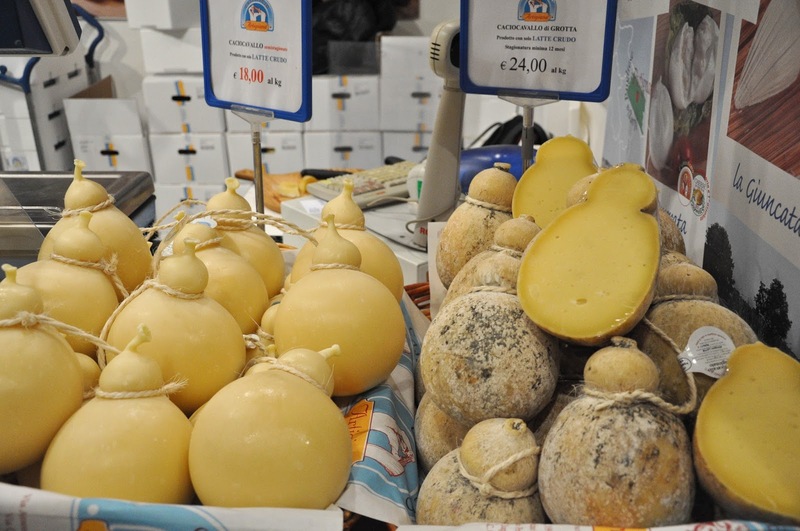 What I love about Italy and its food is that it is very easy to find small- and medium-sized independent producers offering one-of-a-kind products. 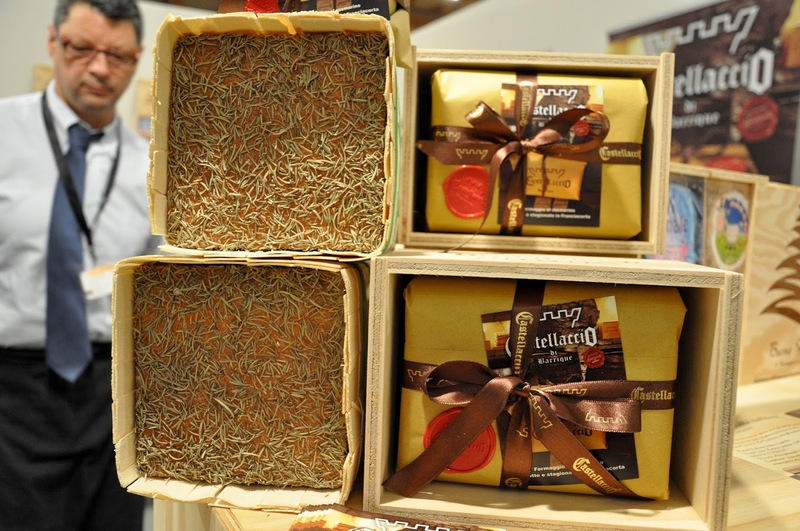 Small farms, single-shop bakeries, artisan chocolate makers, fruit tree growers are abundant in their numbers and it is easy to bypass the large multinational companies and buy directly from them. I don’t know if this is because the government actively supports them. 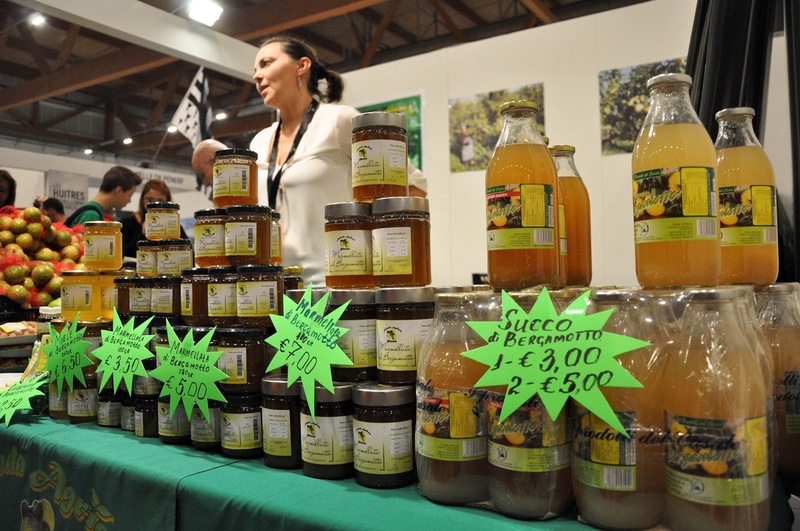 I would imagine though that it is mostly down to the fact that Italians seem to prefer to engage in small-scale family businesses and to give all their time and effort to growing a small independent brand. And so the fair was perfectly representative of this. 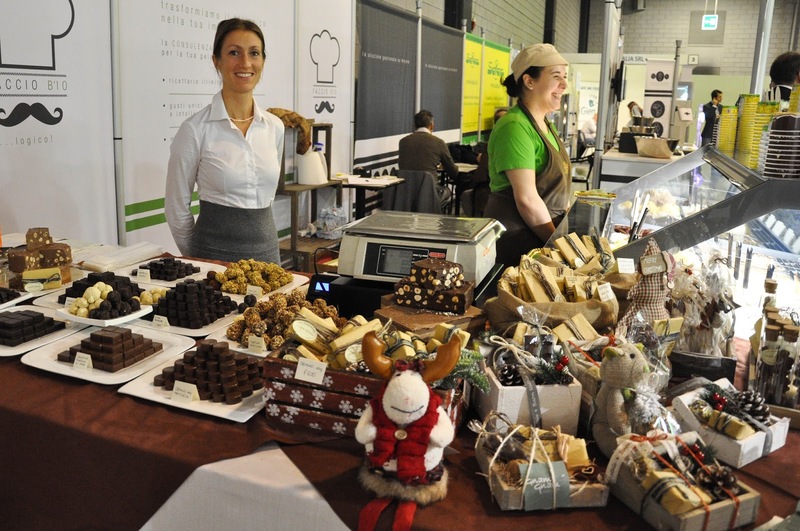 Hundreds and hundreds of small and medium producers were there showcasing their wares to the discerning crowds. 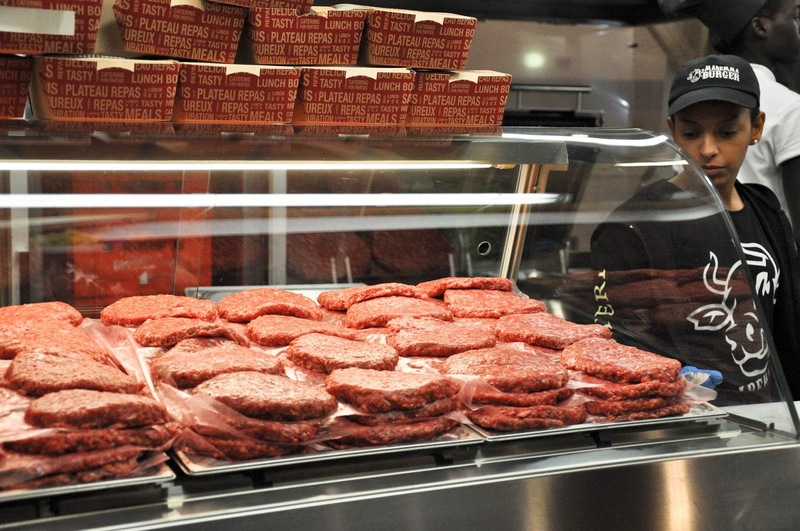 What I particularly loved about it all, is that the products were beautifully presented. A lot of thought and design skills had gone into coming up with the different boxes, bottles and wrappers I saw. 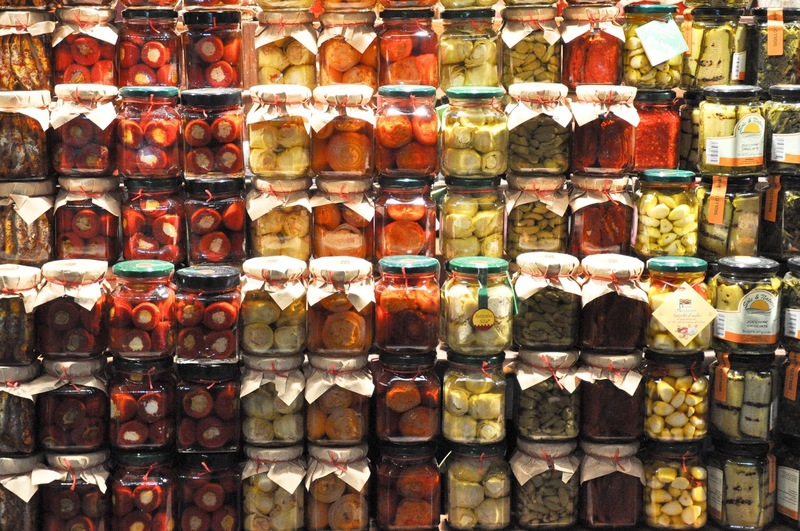 You could pick a piece of cheese or a jar of preserves or a bag with cookies and not be ashamed to give them as presents to the most discerning gourmand. What I wasn’t so impressed with though was the varying level of customer service. After years spent in England, where people in customer environments are incredibly polite and happy to make small talk and tell you as much as you want to know about their products, it was at times discouraging to approach a stall at this fair and to be ignored by the people manning it. I was very interested in a particular brand, which I had read lots about and wanted to feature on my blog. It was quite lucky that we found their stall, considering the huge number of other stalls there. Yet, the two people running it, ignored us steadfastly, even though they didn’t have any other customers at that moment precisely. So, in the end, I didn’t even introduce myself and dropped my idea. It was much nicer to approach the stalls run by smiling people and have a little chat with them about what they were selling. 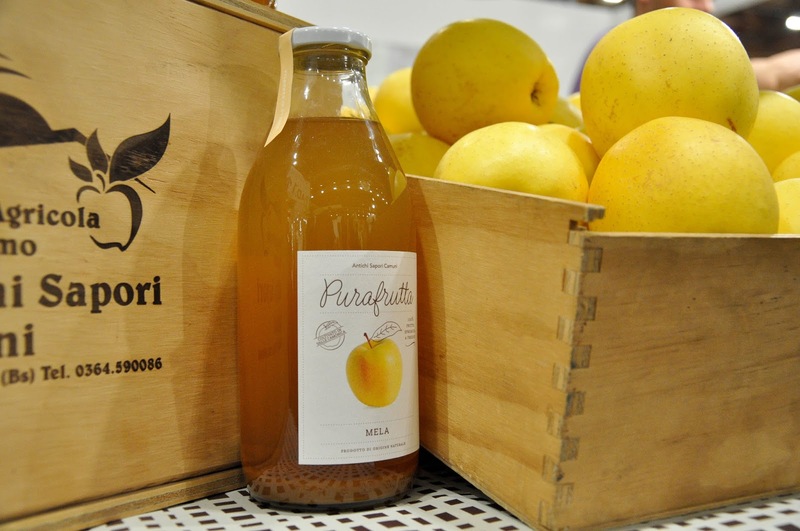 We were particularly taken with this amazing apple juice sold in old-fashioned glass bottles. 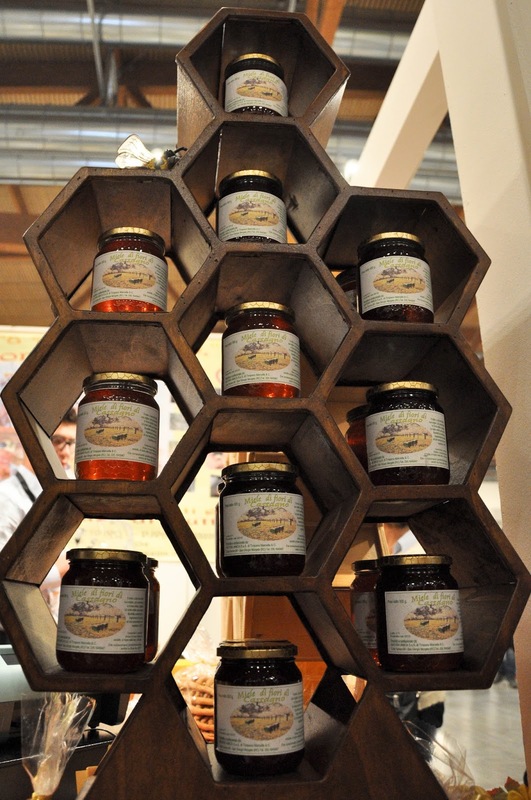 The company which produces it – Antiche Sapori Camuni – also makes the most flavoursome marmalade sold not in jars, but in blocks. It stayed firm, but as soon as you picked a small piece off the block, the marmalade was soft and fragrant on the tongue. 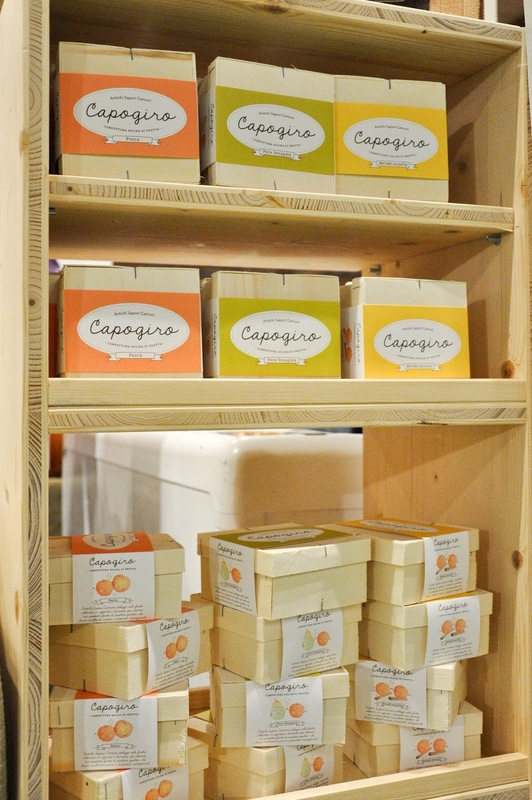 I also loved coming across the stall of Panetteria Pasticceria Bessone from the region of Piedmont. 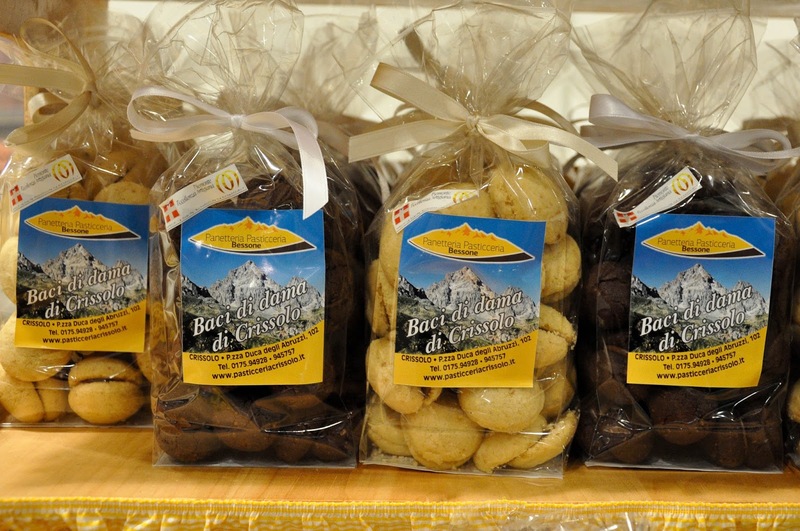 We bought some of their Baci di Dama – traditional Italian hazelnut biscuits sandwiched with chocolate spread – for later and sampled their many bakery products, too. Yum! 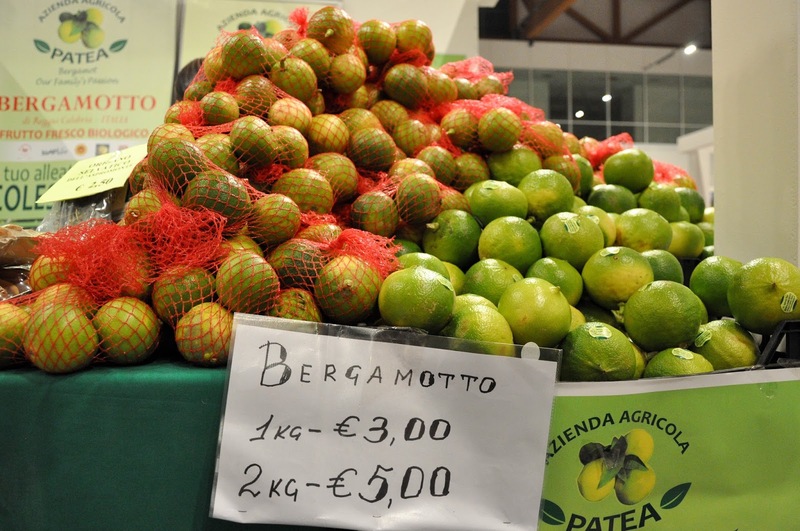 My husband got very excited when we came across the bergamot stall of Azienda Agricola Patea from Reggio Calabria. For all the gallons of Earl Grey tea we have had through the years, we had never actually seen a bergamot before. So, we had to stop and try it for ourselves. As it turned out, this round dark green fruit, which looks a lot like a large lime, is rather sour, but very refreshing. 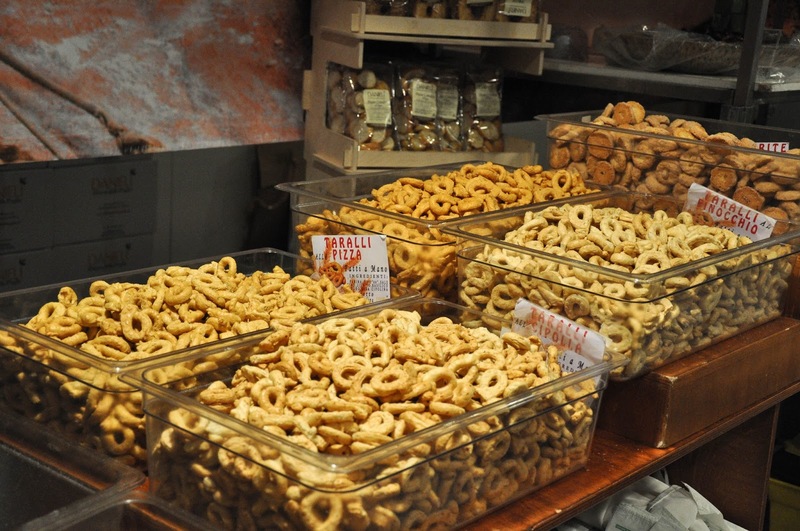 We walked round the fair, taking it all in – cheese with rosemary, preserves from Calabria, nougat and taralli – just imagine a small hard breadstick which has been bent into a circle with its ends criss-crossed one on top of the other – all the way from Puglia. At the back of the hall, the pizza place and burger stalls were doing brisk business with people sitting down for a well deserved break after hours scouring the fair. It was all very relaxed and lovely to be around. We didn’t even realise how three hours had flown by. So, after one last stop at the Hotel Willy‘s stall, where we bought a plum crostata – a typical Italian pie – we were ready to head back home. 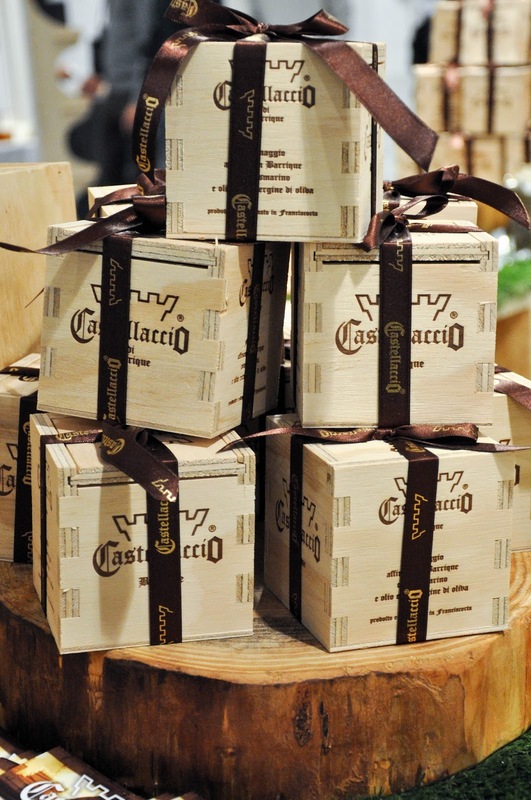 Later that evening, after a hearty supper, we cut into our crostata which had come to us all the way from the Italian region of Friuli Venezia Giulia and shared round the table the Baci di Dama from Piedmont. It all tasted good! Really good!